At the foot of undeveloped hills in the historical neighborhood of El Sereno, in Los Angeles, CA, we will nurture an ecologically efficient solution to fears of fiery destruction. This campaign will establish a local source for fire prevention and protection for the surrounding streets and homes in the area that is in tune with nature's processes. 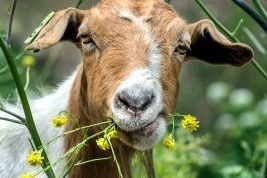 We will raise and train a herd of goats to conduct brush clearance and serve as a community resource in future agricultural endeavors. In the face of some of the most violent and destructive brush fires in the state's history, we need an effective means for keeping our local hills clear from the fuels that cause fires to spread and grow. This campaign will keep the neighborhood safe and bring back some of the area's ranching/herding heritage. By donating to this campaign, you will be part of the protection of our community in the most natural and ecologically conscious ways. Funds from this campaign will be used to purchase the herd, build up a sustainable enclosure space for them to be housed, acquire portable fencing materials for the herd's controlled grazing, and other necessary materials to provide brush clearance in the community. This funding will help launch a dream of many neighbors and get us started in controlling the threat of wild fires with wildlife. We will be able to connect with city Fire Department to access and clear brush on some of the most challenging hillsides and properties in the area with the highest efficiency.